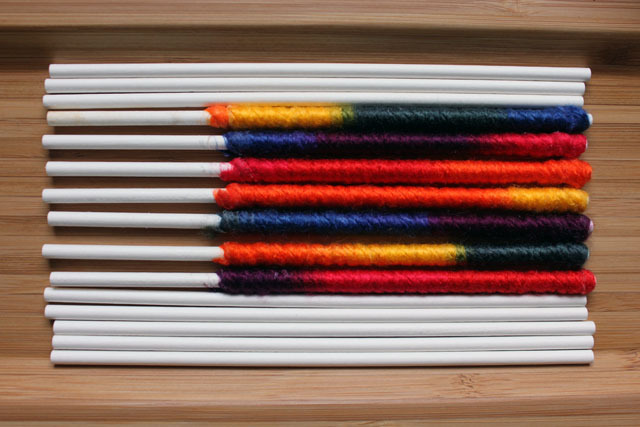 It’s getting to be sweater weather around here, and though I don’t knit, I do keep this colorful variegated yarn on hand called “schoolyard.” The colors in this yarn remind me of a basic box of Crayolas, and I like to use it for tying up brown paper packages and cellophane bags of goodies. 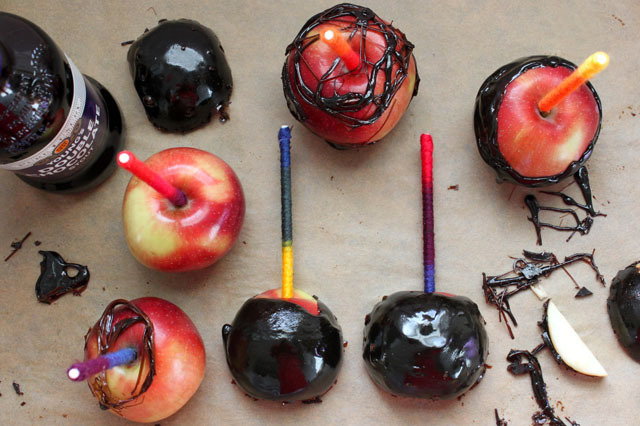 The other day I brought it into the kitchen and used it to cozy up some naked lolli sticks for this year’s festive candied apples. Last year I bookmarked this Brooklyn Brew Shop recipe on The Mash and thought it was prime time to try it for myself and cozy up some bare apples! 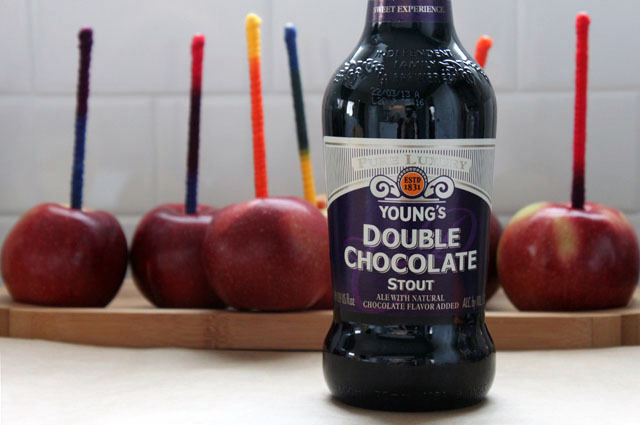 I followed the outlined recipe with the exceptions of subbing light brown sugar I had in the cupboard for the dark brown sugar and the always cozy double chocolate stout (stout = “porter on steroids” as once described by a beer shop guy) for the maple chocolate porter listed. 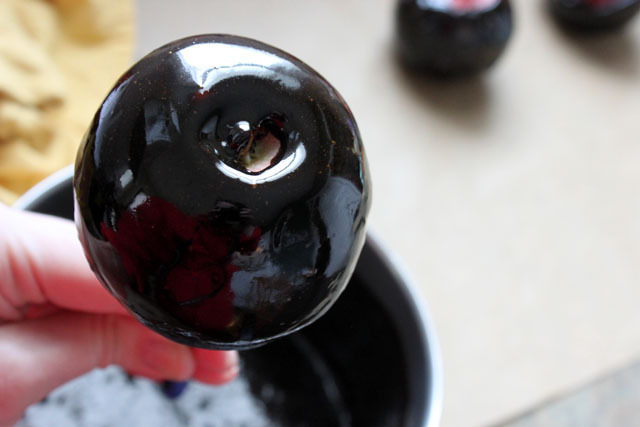 I had difficulty actually biting into the candied apple, so I ended up slicing the apples and serving them that way. The look of the toffee is sinister and the flavor is slightly sweet with hints roasted coffee. I think I will make another batch of toffee and form a few porter candy spiderweb toppers for the weekend (cinnamon/molasses gelato sundaes, anyone?). 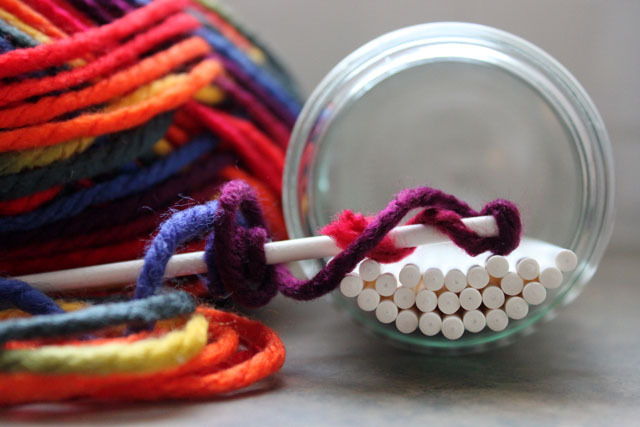 To make your own sweatery sticks, glue the beginning of the yarn at one end of the stick with a dot of liquid glue and overlap to cover the glued piece. Continue wrapping the stick with yarn to desired length and secure the end with another dot of liquid glue. Wow. These look seriously yummy. 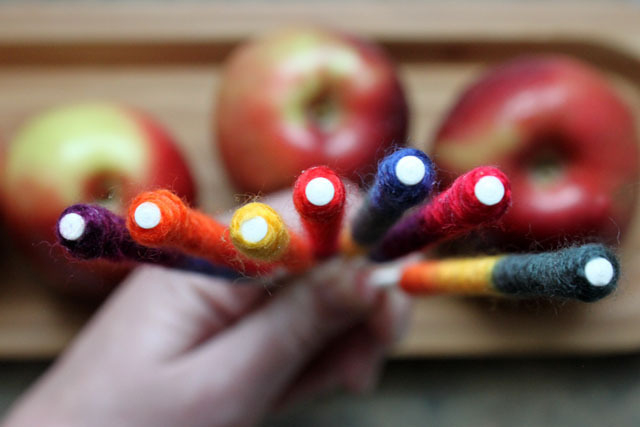 Very dramatic colours in the yarn and the shiny and chocolatey dark gloss on the apples. Stunning! they look very sweet and cute! lovely!